Yowzer…a whole new color in Climbers! 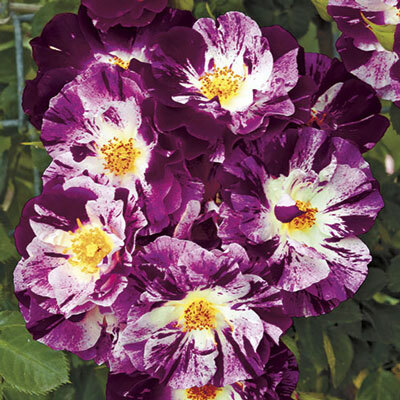 Imagine Weeks' famous Fourth of July rose in shades of purple. Although they're distantly related, this kissin' cousin blooms in even larger, more pyramid-shaped clusters of flowers & doesn't have nearly the thorns. Set these splashy colors against bright Granny Smith-green foliage & you've got a killer combo for any fence, wall or trellis. Vigorous, clean & free-flowering…it repeat blooms readily in the very first year. More stripes show up in cooler weather. Plant Height 9' 10" to 13' 1"